It’s been 100 years since the first Good Friday procession in Żebbuġ, Gozo. Carmel Saliba traces its history. 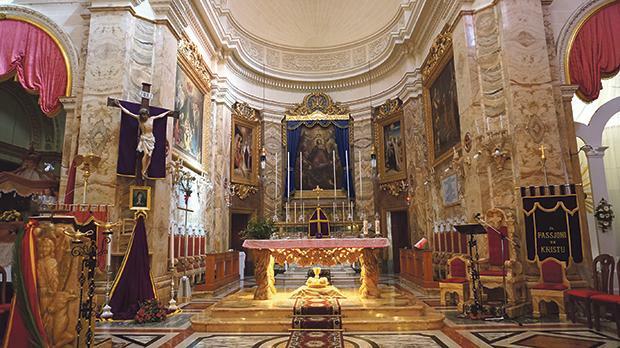 The interior of Żebbuġ parish church. World War I in 1918 had just ended when the newly appointed parish priest of Żebbuġ, Gozo, Fr Anton Grima, ordered a set of eight statues to be used in the Good Friday procession. The statues were to be done in papier mâché by artist Augustine Camilleri. 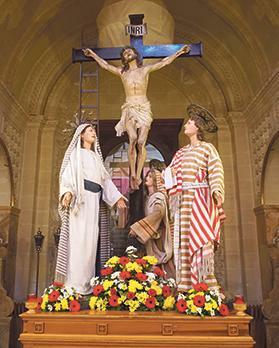 Four of these statues are still in use today and they consist of the Christ crowned with thorns, Our Lady of Sorrows, the Crucified Christ and the Dead Christ. The other four were damaged between 1936 and 1942. The damages contributed to the decision to stop the procession from being performed. This was also the time when the parish church was being enlarged. The Crucifix of 1919, St John the Evangelist and Mary of 1966 and Mary Magdalen of 1967. The procession was reintroduced in 1965 by the then newly appointed archpriest, Fr Aloysius Vella. He was granted permission by the Bishop of Gozo, Joseph Pace. That year the procession featured only the four surviving statues; however, six new statues were ordered – and finished – the following year. The new statues consisted of the Redeemer, Veronica, Christ in the Garden of Gethsemane, St John the Evangelist, Our Lady of Sorrows near the Crucifix and Christ at the Column. These new additions were supplemented by the Mary Magdalene statue in 1967. This year also saw the restoration of the old statues. In 1968 the Last Supper statue was also finished. It is to be noted that this statue is the only one of its kind in Gozo. In Malta another statue featuring the same scene is featured in the parish of St George in Qormi. All the new statues were done by the same artist who produced the 1919 statues. The statues’ platforms (bradelli) were made by Anthony and his son Joseph, while the original clothes were made by a group of volunteers under the direction of Cathrine Cini. Since the reintroduction of the procession and up to 1994, the procession never actually took place on Good Friday due to the absence of a local band. This fact was also seen as an advantage since other Gozitans were able to enjoy the event. This stopped when in 1995 the St Mary Band of Żebbuġ was formed and the procession started to be held on Good Friday. Other notable features of this procession are the ‘newl’, a type of clothing weaved by the Żebbuġ people themselves. These were introduced by archpriest Can Noel Saliba and took the place of the velvet clothes which were originally used. Another archpriest – Reuben Micallef – introduced more personalities to the procession. This year will mark the 100th anniversary since the procession of Żebbuġ, Gozo was introduced. It will be led by the newly appointed archpriest, Can Ġwann Sultana. This procession has been growing in popularity year after year. May it continue getting better for the enjoyment of all the faithful and Good Friday procession lovers.